If not for a preponderance of evidence to the contrary, including but not limited to a very funny episode of Bob’s Burgers called “The Equestranauts” that aired in April 2014, it would be reasonable to think Brent Hodge’s A Brony Tale is an elaborate, ingenious hoax-umentary. It sounds like something in the tradition of F For Fake, intended to satirize the incredibly specific sects of fandom enabled by the Internet, and the almost eerie degree of I’m Okay, You’re Okay rhetoric many such movements espouse. Given how decisively the Internet has proven its resilience as a delivery system for callow, cruel, even hateful speech—comment threads being the natural habitat for the kind of discourse James Brown described so unforgettably in 1970 as “Talkin’ Loud And Sayin’ Nothing”—it seems perverse to condemn anyone for promoting such an inclusionary ethos. Still, it’s tough not to approach it with some skepticism. Alas, the self-identified Bronies are real. (Indeed, the briskly edited and upbeat A Brony Tale is the second film about them, following Laurent Malaquais’ Bronies: The Extremely Unexpected Adult Fans Of My Little Pony.) Bronies’ fealty is not just to the vast, 31-year-old My Little Pony media and merchandise diaspora, but specifically to the fourth animated TV series based on Hasbro’s line of little plastic horses for little girls, the moral-as-subtitle My Little Pony: Friendship Is Magic. The Bronies are predominantly heterosexual, predominantly college-educated, and overwhelmingly male (although some female fans do self-identity as Bronies), with a median age of 21—at least a decade older than the core little-girl audience at which Friendship Is Magic is ostensibly aimed. This is all according to Marsha Redden and Pat Edwards, two lab-coated psychologists Hodge consults for insight into the Brony psyche, who explain that the Bronies they’ve surveyed—some 30,000 of them—tend to score much lower for unhealthy neurosis than the public at large does. Hodge’s glossy, colorful film centers on his friend Ashleigh Ball—a Canadian singer and voice actor who supplies the voices of two of the show’s main characters, Applejack and Rainbow Dash—who receives an invitation to 2012’s Bronycon in Manhattan. “The pervert alarm, for sure, went off in my head when I first heard about it,” she says. Hodges uses Ball’s deliberations vis-à-vis whether to accept the VIP invite as a framework to explore the group’s origins, ethos, and factions. 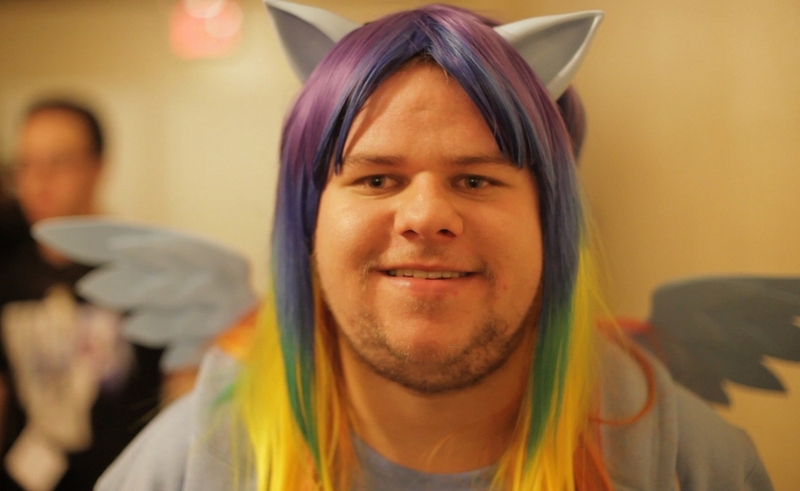 He introduces viewers to active-duty military Bronies, an Atlanta Brony DJ named SilvaHound, a Washington, DC Brony bodybuilder who goes by Jaxblade, and one or two just-folks Brony… bros. If Hodges made any attempt to contact the writers of the Friendship Is Magic TV show to find out what they make of this secondary constituency they’ve acquired, it isn’t reflected in the film. Ball gets more screen time than anyone else, and she’s a relaxed, appealing subject. This is unsurprising given that besides being a professional actor, she’s also the frontwoman for the three-piece indie-pop band Hey Ocean!, which supplies the film’s bubbly electronic score. A Brony Tale’s major flaw is that it’s really more of “An Ashleigh Tale,” in that Ball is treated as the “normal” one against which the oddity of various Bronies can be measured. Hodges intimates this idea only gently, and he’s certainly never mocking or disrespectful of his other subjects, but the suggestion is there. As a thesis statement, this is fairly unimpeachable. And by the time Hodges introduces Bryan Mischke—a young artist who fell into a severe depression after his tour of duty in Iraq, until his discovery of Friendship Is Magic inspired him to pick up his pencil again—any further objection to their curious passion seems like horseshit. This is an accessible, briskly paced documentary about a phenomenon that warrants exactly the level of investigation Hodges has given it here. These are all grown men. They’re too old to worry about whether someone thinks they’re weird for watching a TV show for little girls.